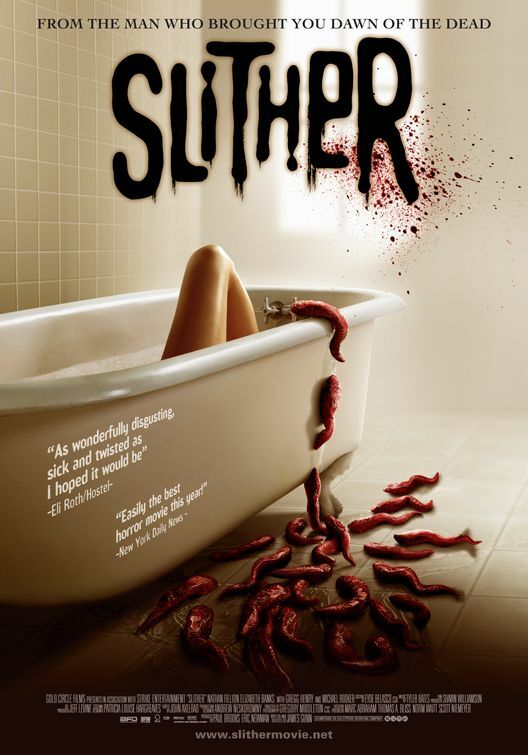 Tag line: "Feed the Fear"
Part monster movie and part alien invasion flick, director James Gunn’s 2006 horror / comedy Slither pays homage to the films of yesteryear while, at the same time, relying on modern CGI to bring its creatures to life. Grant (Michael Rooker) and his young wife Starla (Elizabeth Banks) are having marital problems. One night, to escape his troubles, Grant goes for a walk in the nearby woods with Brenda (Brenda James), a girl he picked up in a bar. But instead of having a good time, the two come face-to-face with an alien slug, which proceeds to take over Grant's body. When Starla notices a change in her husband, she turns to the town’s sheriff, Bill Pardy (Nathan Fillion), for help. Unfortunately, they may be too late to save Grant, but what they don’t realize is the creature living inside him has a plan to conquer the entire town, and, eventually, the world. Aside from the obvious similarities to 1986’s Night of the Creeps, a movie in which otherworldly slugs invade people’s bodies, director Gunn (who also wrote the screenplay) loads Slither with clever references to several other genre classics (a local bar is named Henenlotter’s, in honor of the director of 1982’s Basket Case). Yet while horror fans may get a kick out of these tributes, it’s the monsters that make Slither such an entertaining movie. In the film’s best scene, Sheriff Pardy and his deputies are on a stake-out in the middle of nowhere, trying to capture Grant. But none of them are prepared for what comes stumbling out of the woods, nor are they ready to face what's in a nearby barn, where poor Brenda is being used to carry out the alien’s diabolical plan. Many of the other effects in Slither, like the hundreds of slugs crawling across the ground, look great, but it’s the insanity of the above sequence that’ll stay with you the longest. A fun movie from start to finish, Slither will make you laugh, make you squirm, and, ultimately, make you damn happy you saw it. Sadly disappointing movie. Some nice moments, but ultimately a waste of a good cast, I thought. Rooker was good as the conflicted monster. Avengers Infinity War REVISITED! Clues for Endgame and New Easter Eggs!